The basic premise of this book is both simple and yet diagnostically powerful. The author argues that when a couple enters therapy, both partners have either explicit or implicit understandings of what can—and, more importantly, cannot—be discussed in therapy. Collusion between partners, whether consciously or unconsciously negotiated, serves two basic functions: to protect the partners’ respective selves and to preserve the dyadic status quo. 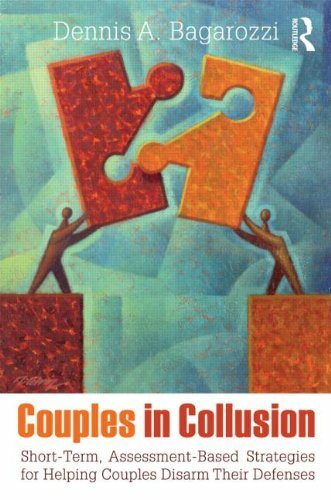 Bagarozzi argues that couples enter therapy when these collusive agreements have failed in some way, and many of them would be content with therapy that allows them simply to return to the status quo. However, although ignoring unconscious processes in their clients’ relationships can lead to short-term ‘success’, the author demonstrates that working through the inevitable defensive resistance and doing genuinely ‘deep’ work can ultimately produce richer outcomes for the couple. Although not formally divided in such a way, there are four ‘parts’ to this book: the theory, the description of patterns of collusion, the discussion of assessment, and the case-studies. Although considering myself moderately well-read, I did struggle with some of the theoretical discussion and was aware of my own lack of reading in object-relations. However, other parts of the book do draw from a variety of theoretical backgrounds. The author uses a series of informal questions as well as more formal questionnaires to assess his clients and their relationship before ‘treatment’. I found the former useful and have already incorporated them into my own early sessions with couples. I could see that the latter did reveal useful areas for discussion, but as most of the instruments used are not made available in the book, and as I would be unwilling to use a battery of tests at the beginning of therapy, I didn’t linger much over these paragraphs. Despite the above negative quibbles, at its core, the book has much to offer the Private Practitioner who works with couples. The book opens windows onto possible psychological underground (for example, collusive defensive patterns, acting out and monitoring and restraining, couple mythologies, complementary defensive systems, primitive defences in borderline and narcissistic disorders). Then, the author patiently uses his wealth of knowledge, experience, and expertise to lead the reader across the minefields to the other side (demonstrating how to defuse a few mines along the way). Most counselling books have case-study material at some point. However, I particularly enjoyed the ones in this book. Bagarozzi gives us key background information before allowing us the ‘see’ his interactions with the couple. We see the positive outcomes as well as the disappointments. I admired the way he was aware of, and able to deflect, the attempts by the couples to draw him into the collusions. This book informed me and left me wanting to continue to strive to become a better therapist. Follow me on Twitter. Why not Tweet me?